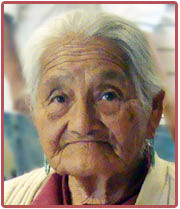 Elders often must make desperate choices of buying food and medicine, or heating their homes. With poor construction and insulation, and with little or no money for winter fuel, it can be almost as cold inside as outside. Your gift helps provide the warmth and comfort Elders need to survive the frigid winter. Thank you! $108 will help provide winter supplies for 6 Elders! $54 will help provide winter supplies for 4 Elders! $36 will help provide winter supplies for 2 Elders! $18 will help provide winter supplies for 1 Elder. Enter your own gift amount. Enter amount. We accept Credit Cards, PayPal and Bank Account Withdrawals. Please choose your payment type. Credit Card Type: We accept Credit Cards, PayPal and Bank Account Withdrawals. Please choose your payment type.